Alfred Franklin was born in Kingston-on-Soar, Notts in 1895 2, the third child and son of John Henry (b. 1863, Roxholm, Lincolnshire) and Sarah Ann Franklin (b. 1869, Gotham, Notts née Staples). In 1901 the family, including their 5 youngest children, was living at Stamford-on-Soar, Notts where John worked as a wagoner on a farm3. By 1911, the family had moved to Ratcliffe-on-Soar, Notts, where John was working as a general farm labourer4. By then, Alfred had left home but has not been found at his new location. As Alfred's Army Service Record has not survived, we do not have a precise record of when he enlisted with the Sherwood Foresters, but it likely to have been sometime towards the end of 1915, becaming part of 17th (Service) Battalion (Welbeck Rangers), formed at Nottingham on 1 June 1915 by the Mayor and a Recruiting Committee. In October of that year, it moved to Aldershot and came under the orders of 117th Brigade, 39th Division, After a further move, to Witley Camp, south of Godalming in Surrey, where training continued, the Battalion landed at Le Havre, France on 7 March 1916 as part of 98th Infantry Brigade 33rd Division5. Throughout the remainder of March and most of April, the battalion undertook realistic training in trench warfare, even taking considerable casualties in the process. By 24th April it was in the trenches at Le Touret and was subjected to a gas attack on the 28th. Routine trench work continued at Festubert, Hingette, Gorre, Givenchy, Ferme du Roi and elsewhere during the whole of May and June, during which some casualties were taken. On July 3/4th, men of the battalion carried out a planned raid on the German trenches which generally achieved its objectives, despite strong opposition, with some casualties6. It seems likely that Private Franklin was one of twelve other ranks wounded during this raid. After receiving basic emergency treatment in a nearby Regimental Aid Post he would have been passed back to an Advance Dressing Station, then to a Casualty Clearing Station which would organise transfer to a military hospital7. It appears that, through this system, Private Franklin arrived at one of the large group of hospitals then operational at Etaples which could deal with 22,000 wounded or sick at its peak by the end of the War. Sadly, despite everyone's best efforts, Private Franklin died from his wounds on 13th July. He was buried in the nearby Etaples Military Cemetery. 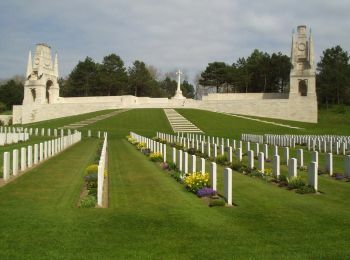 This cemetery, the largest Commonwealth War Grave Commission cemetery in France, contains 10,771 Commonwealth burials of the Great War. It also contains 119 burials from the Second World War and 662 Non Commonwealth burials, mainly German. By about this time, John and Sarah Franklin, with the younger members of their family who were still at home, had moved to Beeston and were living at 84 Lower Regent Street8. Sarah Franklin, as his sole legatee, was paid Alfred's financial effects of £5 9s on 8 November 1916 and his War Gratuity of £3 on 13 September 19199. 6This account of battalion movements and the attack are based on the Battalion's war diary. 8Certainly by March 1918 when their son John took a job at Beeston Foundry. John and Sarah continued to live at this address until their deaths in 1930 and 1933 respectively. 9Details of the payments are from the "Army Register of Soldiers' Effects, 1901-1929" - available on ancestry.com. The amount of his Gratuity confirms that he had served for less than 12 months.